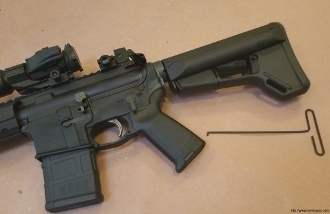 Magpul makes some great stocks for AR rifles - especially the collapsible stocks with friction locks. The ACS, ACS-L, CTR, and STR family of stocks all have a lever in the front that when pressed locks the buttstock firmly to the recoil tube. This is a real cool feature. To install these stocks, one must lift the release pin up higher than what the release lever can actuate. Magpul sometimes includes a plastic 5.56 round to help left the pin but it can be a challenge. I have carpal tunnel and getting that pin to lift made me create a tool that makes life way, way easier. Our tool is T-shaped to give an easy handle to hold. When the adjustment lever is pressed towards the recoil tube, the release pin rises up part way and a slot is exposed. The small hook at the end of the tool can be inserted in that slot and then by pulling the pin away from the tube with the tool, the stock becomes very easy to install or remove. It really makes things way easier. Please note that we do not represent Magpul in any way nor do they endorse our tool.